You should all thank my husband. He is always requesting that I make things and then I do and then they turn out amazing and then I post them and then, and then, and then! This is just what it says, a "plain ol' custard pie". Simple and comforting. At my husbands request I made it with a cookie crust the first time. Can you say, "HURL"? Soggy, nastiness overload! So when I told him I would remake it the normal way, he was thrilled and asking daily when I am making it! 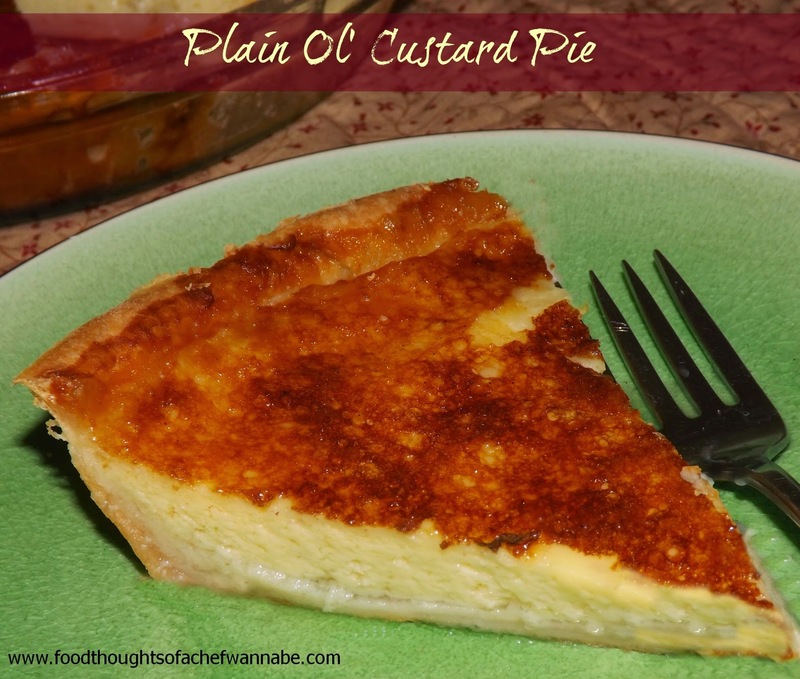 I had planned on making several recipes today so I threw pie crust and custard pie into the mix! The filling will fill your pie plate to the brim. Please use a deeper than normal one. Also when you pour in the filling, please put the shell in the oven first and then pour because transferring that full of a pie is nothing more than a recipe for disaster! Make sure to let this cool to room temp and chill for at least 2 hours as suggested, but longer would be even better. I also did not blind bake my crust. It came out perfect, so if you want to do that you can, but I did not. Here is the link for my amazing, pie crust. You can use your own or buy one but they are so easy, and the flavor and wonder of it all just can't be bought! Place all ingredients except pie crust (hardy har har) into a blender or food processor. Whirl that baby until completely combined and frothy. Set aside. Yes, you can do this with an electric mixer or stand mixer, a blender is just so easy! Place pie crust into a deep dish and finish the edge however you like. Place unto a baking sheet and place into the oven. Once it is in the oven then pour the filling in. The filling will come to darn near the top and we don't need any accidents, do we? Pour it in and bake for 60-75 minutes. The middle should have a WEE bit of jiggle to it. OMG, that cracked me up, I wish I only had a WEE big of jiggle to my middle. Regardless, when it does, remove it and let come to room temperature, then refrigerate for 2 hours minimum before cutting. Interesting but as you can see in the photo my crust didn't burn! Don't jinx me now! HAHA! Thanks for stopping by! !